Down the years many farms, estates and even villages in rural north east Wales have produced their own power using water, long before electricity was freely available. As well as the more well known mills using water wheels, such as the one that stands as an ornamental feature at Llangollen restaurant, the Corn Mill, and the historic Rossett Mill, there are clues that water power has been harnessed elsewhere. Monks at Vallé Crucis Abbey Llangollen, and Basingwerk Abbey Holywell, generated power from water hundreds of years ago. Now, rural regeneration agency Cadwyn Clwyd has launched a project to revive small-scale hydro-electric power production in rural Denbighshire, launching feasibility studies for using water power on the Dee at Llangollen, and on the Alyn at Llandegla and Loggerheads. One of the sites being considered to is that of Dylan Parry's farm, Ty Ucha'r Llyn, in the hills above Gwyddelwern, which has been worked by the same family for six generations. His grandfather installed hydro-power in the 1930s, providing lights for the house as well as powering farm machinery including the milking machine. Dylan's father, Ifor, 77, remembers it well: "It was marvellous what they could do - they were very inventive." Cadwyn Clwyd's energy project officer, Silas Jones, has identified a number of sites where hydro power was once used. "Llandegla once had the electric lights in the village powered by a local hydro scheme," he says. "And so did many of the great houses like Rhug as well as many farms like Ty Ucha'r Llyn." In a tiny community called Ddol Ucha, near Mold, villagers generated their own power in the 1920s, as Joan Tapper remembered when she took part in one of our former Then & Now film projects a couple of years back. "My father wanted to generate electricity to the home, the farm and buildings and we also gave the electricity to the local Ddol Chapel for their use," she recalled. "We used to saw wood and we used to grind corn and it never broke down." 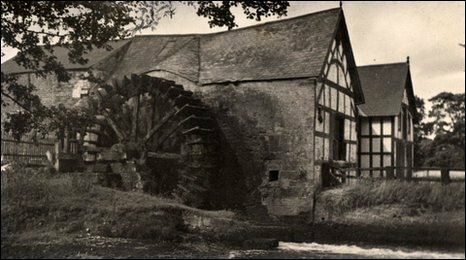 John Harrison (1877-1941) took this photo of Rossett Mill c1920. He toured the region by bike taking photos, according to grandson Mike. Can you tell us where water power is or has been used previously? 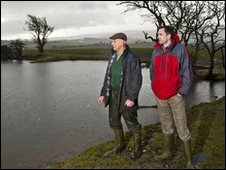 Ted Edwards, Llanelidan: "I have for some time tried to generate interest in power from our rivers with little success. It appears that our government prefers to erect these giant wind farm monstrosities on our hills and waterfronts which appear to be very inefficient. We have an abundance of rain into our rivers which could be harnessed and be 90% efficient without detriment to nature. Take the river Clwyd as an example between Ruthin and Melin y Wig, some eight miles. There were seven watermills driving heavy machinery grinding corn for feed, all with a mill race (remains of these can be seen today) that took water from higher up the river. This principle could be used to drive turbines providing electricity. The power house could be sited away from the river out of sight, the race discharging the water further down the river. No detriment to fish or wild life." Graham Green, Canterbury: "In reply to Steve from Corwen, there was indeed a "power house" at Rhug. The shell of the building still remains and on some of the walls insulators are also to be seen. The lake at Rhug is an artificial one with an earthen dam at the bottom end. There was a sluice gate to assist in the control of water the surplus being diverted to a stream which ultimately lead to the Dee. As a boy growing up in the area I remember fishing that lake by the kind permission of Lord Newborough who insisted that we only fly fished and took no more fish than we needed. I remember these days with fond memories of Rhug where my late mother Eleanor was the gardener and my late aunt Margaret was the cook. Now spending my time between Kent and Brittany, France, I often find my memories of the area give me great comfort especially when feeling a touch of 'hiraeth'." Alan Roscoe, Pontblyddyn: "If you take a stroll around Erddig country house grounds you will find an alternative form of water energy called the Cup and Saucer. The water from a small stream is funnelled into the saucer, where it is accelerated by being fed into ever smaller circles until it falls into the cup. From the outlet of the cup it pushes a piston which originally had leather seals. The piston pushes the water uphill to the house for domestic use, very clever as the waste goes back into the stream to be recycled. Not exactly perpetual motion but a damn good try." Fred Knox, Carlisle: "There used to be a large mill in the village of Hawarden, it was fed from a large pond via a sluice. It was used for grinding corn, no cost to anyone, no carbon emissions, just the old 'water as energy'. Anybody remember the old Hawarden Mill?" Cadwyn Clwyd's energy project officer, Silas Jones: "It's great to read the responses made here as these could be very useful in the development of the project. As a matter of interest Cadwyn Clwyd commissioned a feasibility study into the potential of generating hydro electricity at the Loggerheads site. The report was promising and the scheme is being considered by the Environment Agency and the local authority. We have also commissioned studies on the River Dee at Llangollen and the Alyn at Llandegla. If anyone has other sites they remember from Denbighshire then please let me know." 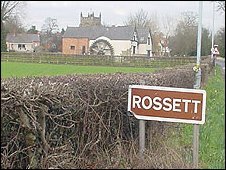 Clwyd Jones, Cheshire: "I was brought up on a farm near Ruthin in the 1950s. During that time the electricity to the farm was generated by a water turbine. My grandfather built it in around 1925 from what was previously a large water wheel. It was a twin wheel turbine which I believe was made in Bala. The wheels were fed water from a reservoir which was filled from a tributary of the River Clwyd and controlled by two valves. A small valve for low output, a large valve for high output, and both valves open for 'turbo boost'. It provided most of the farm's electricity requirements for over half a century without producing an ounce of carbon emissions." Ian Rodgers, Llangollen: "I think that power used to be generated in Llangollen from the river Dee. If anybody has any further information I would be very interested." Kate Jones, Lancaster: "When I was a child growing up in Wrexham, I remember there being the remains to a mill wheel at Nant Mill, near Bersham." Ray, Dyserth: "There are a couple of water mill sites in Dyserth, Denbighshire, in the Marian Mills area. One is the shell of the mill building known as Grove Mill and there is another within about 300 yards on the Offa's Dyke walkway." Steve, Corwen: "I'm sure there is one at the Rhug estate in Corwen. Also, possibly one in Henryd, Conwy." Bill Garman, Mold: "My dad showed me a 'pelton' wheel hydro power scheme at Cefn, St Asaph. It used to supply local estate properties circa 1955." Brian G Wills, Holyhead: "There has been a water operated generator in the village of Llanuwchllyn near Bala for many years providing power to a number of houses in the village." 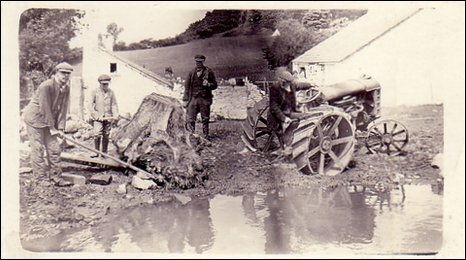 Rob, St Asaph: "The mill at Loggerheads was a part of the extensive lead mining in the area. On the other side of the river, there is a 'leet' watercourse, which carried water on a level to mine workings further down the valley." Gareth Hughes, Bromsgrove: "As a teenager in the 1960s and 70s I lived at Tremorfa Farm, Tyn-y-Groes, Conwy, and I remember there was a defunct hydro power plant in the farm buildings."